I make all my items start to finish, from cutting the fabric to trimming the threads! I pay particular attention to detail and take great pride in turning out a beautiful product. Ready to ship items will be shipped out within 3 business days of purchase. This wallet is huge and amazing! This was a birthday gift for my sister and she's obsessed with it. She loved the Avengers but it's so hard to find wallets with Hawkeye, Falcon, Black Widow and all the other under appreciated Avengers. 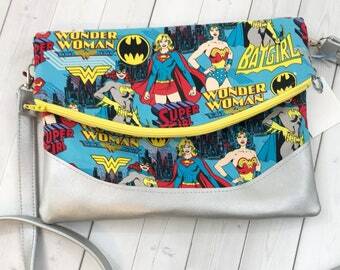 This wallet has the cutest print with a good mix of characters. However, the best part is how large it is. She can fit all her cards, cash, coins, and even a pen in it. This shop is awesome! I'm looking into purchasing a purse from them for myself soon. Thank you for the custom order it is absolutely amazing !! Everything you see is something I sincerely enjoy making. I'm a nerd, a Disney lover, appreciate comfy clothing for myself and my kids, love stripes, and a kid at heart. Returns must be shipped in original condition within 2 days of receiving the item. Purchase price, minus shipping costs, will be refunded. I accept Paypal and credit cards via Etsy's direct checkout. Payments must be received within 48 hours of an order, or I reserve the right to cancel the sale. E-check payments through Paypal must be cleared before shipping. Custom orders must be paid for before they are sewn, due to the time and materials involved in making the garment. Orders will be shipped to Paypal address unless I am contacted by the buyer otherwise. For the US, items shipped using USPS First Class within 3 business days of receiving payment. Internationally, items shipped using First Class International or USPS Priority Shipping (default to which method is least expensive, unless you ask otherwise) within 3 business days of receiving payment. Turn around time on these orders is currently 3-4 weeks. If you need them sooner, please contact me ASAP! Timeline for custom orders to be determined with purchaser.